Nobel-winning contribution: Discoverers of mechanisms of autophagy (self-eating) in Eukaryotic cell. Fact 2: What is Autophagy? Macroautophagy (“self-eating”, also called as autophagy) is an evolutionarily conserved process whereby the eukaryotic cell recycles part of its own content by sequestering a portion of the cytoplasm in a double-membrane vesicle that is delivered to the lysosome for digestion. Fact 3: Major Functions or why Autophagy is important? Autophagy removes long-lived proteins, large macro-molecular complexes of carbohydrates proteins etc and damaged organelles. It is the only process capable of destroying whole organelles, such as mitochondria, peroxisomes and the endoplasmic reticulum. Thus, autophagy plays an essential role in the maintenance of cellular homeostasis. It mediates the digestion and recycling of non-essential parts of the cell during starvation. It is involved in the removal of old or aged cellular components creating space or new ones. It is involved in immune response; capable of clearing invading microorganisms and toxic protein aggregates, and therefore plays an important role during infection, in ageing and in the pathogenesis of many human diseases. It is linked to physiological processes including embryogenesis and cell differentiation, adaptation to starvation and other types of stress, as well as pathological conditions including neurodegenerative diseases, cancer and infections. 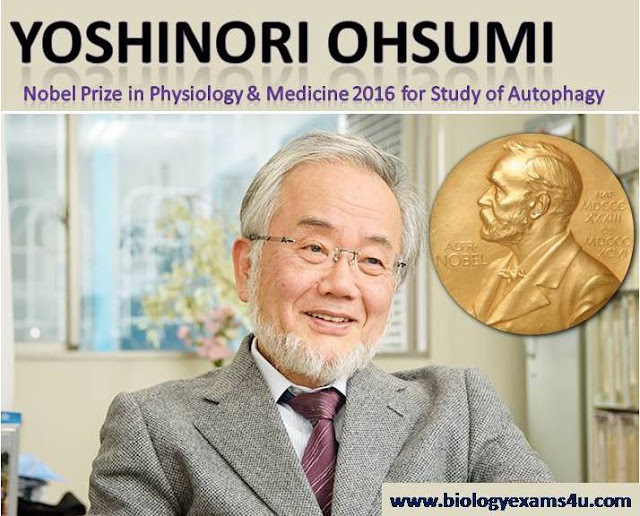 He discovered the mechanism of autophagy which is a fundamental process in cell physiology with major implications for human health and disease. He discovered 15 genes of key importance for autophagy in budding yeast. Further, he cloned several of these genes in yeast and mammalian cells and elucidated the function of the encoded proteins. First question he posed was about the existence of autophagy in unicellular organisms like yeast. The yeast vacuole is the functional equivalent of the mammalian lysosome. 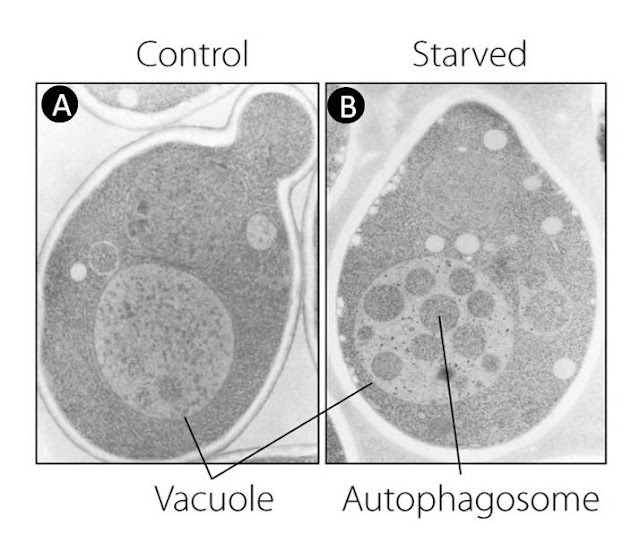 If vacuolar enzymes are inactivated, accumulation of cytoplasmic components in the vacuole indicates the existence of autophagy in yeast. He developed yeast strains that lacked vacuolar enzymes. He found that autophagic bodies accumulated in the vacuole when the engineered yeast were grown in nutrient deprived medium19 or exposed to starve, producing an abnormal vacuole that was visible under a light microscope. He thus identified a unique phenotype that could be used to discover genes that control the induction of autophagy. 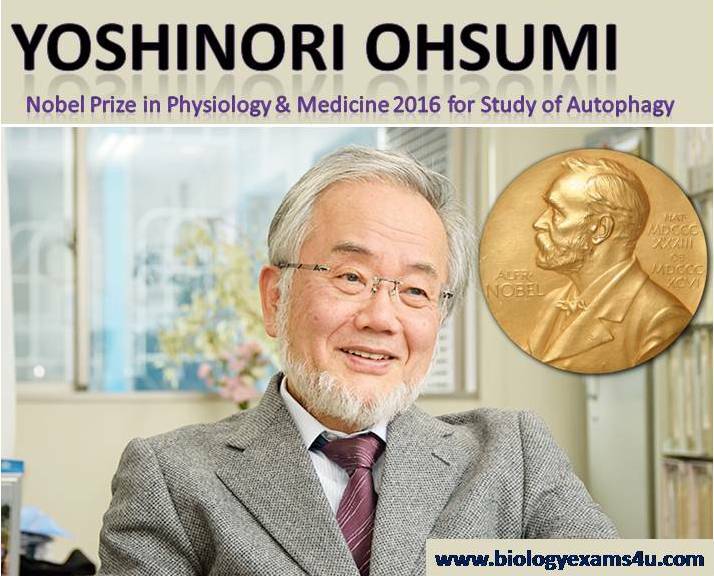 By inducing random mutations in yeast cells lacking vacuolar proteases, Ohsumi identified the first mutant that could not accumulate autophagic bodies in the vacuole; he named this gene autophagy 1 (APG1). Later, he found out 15 genes named APG1-15 that is essential for activation of autophagy in eukaryotic cell.